Nick Ward went 4-for-4, Lester Madden and Chase Calabuig had three hits apiece, and the Snappers bounced back to salvage a season-opening split in a 6-5 win over the Timber Rattlers on Friday night. In a stark contrast to their quiet offensive performance in Thursday's opener, Beloit exploded for 15 hits in its rout of Wisconsin. The win was the first of skipper Lloyd Turner's managerial career. The Rattlers drew first blood on Chad McClanahan's RBI groundout in the top of the first inning, but the Snappers retaliated in the second. After Nick Osborne's walk and a Ward infield single, A's No. 16 prospect Marcos Brito continued his hot start to 2019 with a go-ahead two-run double to put Beloit on the board. Madden and Calabuig followed with back-to-back RBI singles, extended the Snappers' lead to 4-1. Wisconsin cut into Beloit's lead on David Fry's two-run blast in the fifth inning. 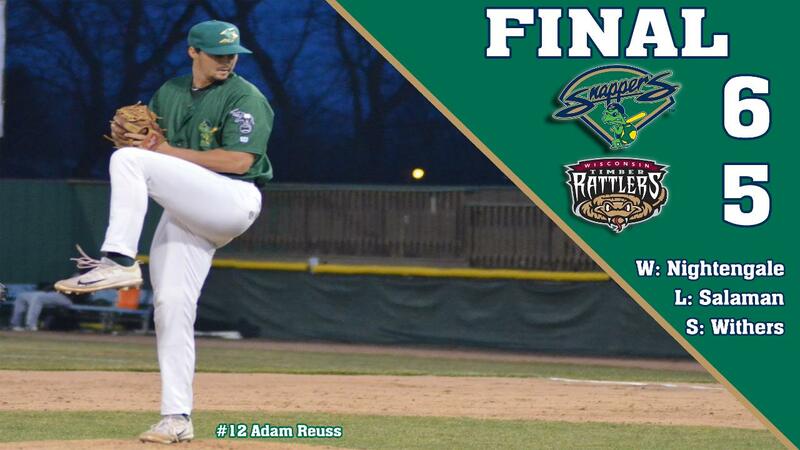 The home run signaled the end of the night for Snappers starter Adam Reuss, who had an uneven 2019 debut. The righty allowed three runs on three hits while walking three and striking out two in 4 1/3 innings. The Snappers answered back with a run in the bottom of the fifth on Ryan Gridley's RBI single. Another Madden RBI single in the eighth inning gave the Snappers their sixth and final tally. The Timber Rattlers managed to make it interesting in the ninth, with Chad McClanahan's RBI single off of right-hander Charlie Cerny pulling them within a run. With the bases loaded and two outs, Turner opted deploy fellow righty Brandon Withers, who struck out Jesus Lujano to record the save. Aside from the multi-hit performances from Ward, Madden and Calabuig, the Snappers also received knocks from Gridley, Payton Squier, Osborne, Logan Farrar and Brito. Fry and Brewers No. 3 prospect Brice Turang each had two-hits nights for Wisconsin. The Snappers' offensive outburst came at the expense of Rattlers starter Wilfred Salaman, who was tagged for five runs on seven hits in 4 1/3 innings. He walked one and struck out one. After Reuss's early exit, right-hander Bryce Nightengale provided 3 2/3 innings of solid relief to earn the win for the Snappers. He gave up a run on two hits while walking two and striking out six. Beloit travels to Peoria tomorrow for a brief two-game set starting at 6:35 PM CT. Bryce Conley will go for the Snappers while the Chiefs have yet to announce their starter. Conley posted a 4.46 ERA in 84 2/3 innings for Beloit last year, including the first six innings of the Snappers' combined no-hitter last April.